Exacme trampolines are made with strong, rust-resistant galvanized steel tubing, which is safer and longer-lasting than conventional welded trampolines. 6 U-shaped legs with 12 balanced contact points add stability and prevent wobbling or tipping, also add more weight capability. Galvanized Springs provide a deeper, more exciting bounce. This 16-foot trampoline has a 375-pound maximum weight capacity, is easy to assemble and requires no tools or extra drilling, and meet all ASTM, TUV, and GS quality and safety requirements. A zipper enclosure allows easy in-and-out, the rust-resistant frame will hold up to years of heavy outdoor use. Details: Trampoline: Rust Resistant Galvanized Steel Heavy Duty Frame; 6 of U-Shape legs; PP Jumping material ; Jumping material Diameter:159 inch; Hot deep galvanized Frame steel ; 6 pieces of U-shape steel tube (hot deep galvanized) ; 12 pieces of Leg extension tube (hot deep galvanized) ; 7" Galvanized Springs ; PE+PVC pad cover in blue color. 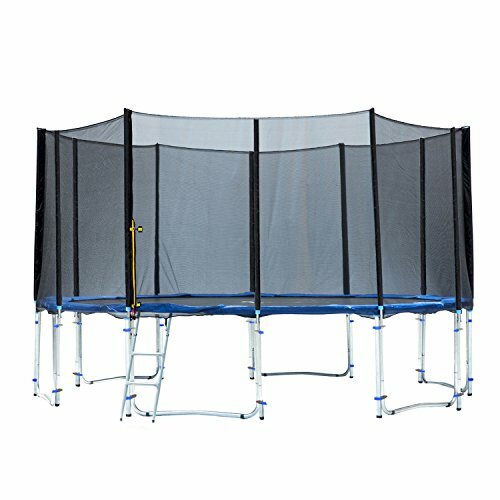 Net Enclosure: Creates a Fun Jumping Environment without limiting Visibility; PE mesh netting; Rust-resistant galvanized steel frame padded with protecting foam for the poles ; All materials are made with durable UV protected material for increased weather resistance; Sturdy straps and ropes to secure net to trampoline ; Trampoline height 3.1ft, height with net 9ft; Maximum Weight Capacity: 375 lbs. Package weight 190 lbs. with 3 boxes. Including:16ft trampoline, net enclosure, Poles , ladder, Clamps, Pole pads, tools and hardware.